Use flexoBag system instead ! Rubber plate hand engraving technician is rather getting old in the corrugated box printing industry as well as no more young man will learn this skill all over the world. In order for solving this problem and helpful for the box printers, the new flexoBag technology of liquid plate making with contemporary discovery of polymer synthetic engineering make the process with only water, no more use solvent in order to keep everything green and lower cost for printing. trying and evaluations for the purpose of reducing resin manufacturing procedure and cost as well as from the progressing synthetic technology. Fortunately it has been proved to succeed in this issue of reducing about 50% of production cost comparing with the old stage photopolymer resins. In addition to this the resolution of fine line / text / dot is now as good as the old expensive resins and ink transfer in the solid area is marvellous due to softer durometers. Furthermore due to flexo plate in a bag concept, machine for liquid plate making is no longer like a miniature plate coating factory any more, a simple designed unit for double side UV exposure at the same time can do anti-tack treatment is good enough for the process, other units like washout / drying / post exposure are remaining the same as the solid plate processor to save repurchase investments. Most important is the cost of equipment is not expensive any more. corrugated printing industry. Keep you far away from toxic solvent and lead you to a green environment. processing time is only 40 minutes which is 50-30% of making a solide plate or a conventional liquid plate. Flat water washout with recirculation and filtration +Drying unit (WD) with built in water heating, circulating and filtration sustem with sticky mounting during washout-no double side tape required. By suing hot seal material without sacrificing tight registration, FlexoBag now is possible to us this Bag Seal unit (BS) by which will reduce bag preparation within 3-5 minute which is a great time saving. By suing compressed air it is easy to input liquid resin into the bag, there is a formula for you to know how much resin has to put in for the purpose of accurate quantity for 3 dimensions of the bag.The bag then move to Bubble remover (BR) for air bubble to disappear and exposure ready for plate making process. procession. Whole processing time to make a FlexoBag plate is only 20-30 minutes, The total cost is only 50-60% of making a solvent plate. @flexoBag is a brand new development of flexographic plate making system for corrugated & paper printing industy This innovative creating is experienced from both of conbentional liquid photopolymer. And salvent plate for 35 years. tolerance within +/- 0.03 mm. good for all kinds to flexoprinting available size up to 42x60 inch (110 x 160cm). lager size equipment is available under your request. @flexoBag water wash-out is the best advantage of this system. Do not have to use solvent means less drying time. Quick ready saving cost form production and envitonmental green. water washout time is only 3 min – for a 4mm plate. @flexoBag includes drying and anti-tack treatment ohole process for a 4 mm plate is less than 40 mointues. Your existing plate making machine is also good enough for this system only a new double side exposure unit is required most important is that total plate making cost is only 50% if a solvent-wash photopolymer plate. 1. How flexoBag liquid system is developed? Since LaserBlack enhance has been created by Flexo Technology Inc. in 2006, we have about 20000 units used all over the world satisfactorily, some of the users want to make big plate for corrugated flexo printing with water washout liquid photopolymer in addition to stamp making by using LaserBlack enhanced to make negative film / paper for economic and practical production reasons. By using this LaserBlack + flexoBag system, most of corrugated box printers are very satisfied with this economic system, they are paying only 10% of the cost which was relied on out sourcing. In addition to pay extra money, they have to wait and wait for the delivery. But now they can make a plate in 10 minutes including negative and plate making which increased lot of efficiency in production for printing. Meantime, flexoBag system is a creation from Flexo Technology Inc. headquarters in Taipei Taiwan with world patents over 50 countries including whole EU market. Because of water wash flexo plate making, the users are all happy with it for no more environmental problem and recycle equipment for them to invest for the wastes. They appreciate and enjoy the inventions of both flexoBag + LaserBlack from Tea@flexo very much. 2. What are the advantages to use flexoBag system for liquid flexo plate making? a. 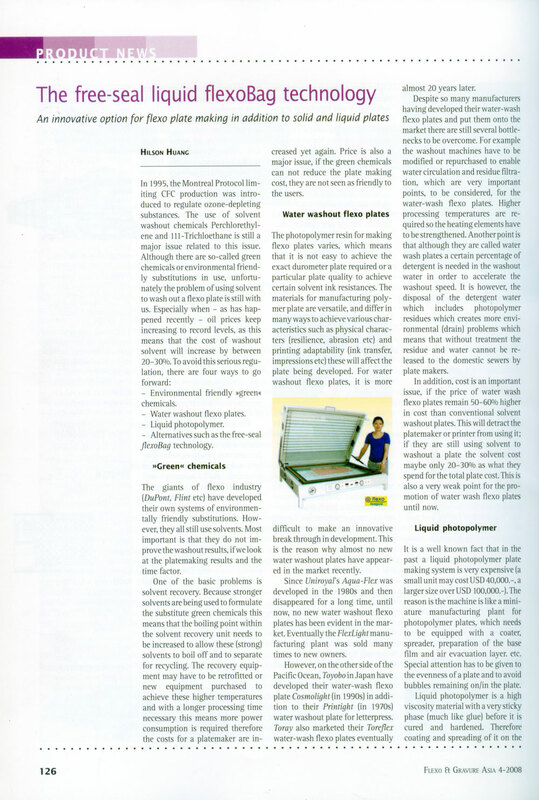 Use liquid photopolymer resin which is the only way to washout by water without using toxic chemical and pollutions..
b. Put the resin in a bag is an good idea of quick processing because of no base film paving / resin pouring and spreading / cover film paving over the resin… these procedures will waste about 1 hour for a big plate to make. And sometimes the resin is still there which will make failure for the plate. c. After filling the resin, the flexoBag is ready for plate making without any bubbles as a PS plate for offset printing, it is ready for film exposure immediately to make plates. d. No more various stock of different thickness / size of plates which is also a big part of capital investment. Only buy liquid resin in KGs. e. Team@flexo has total solution for you liquid flexo plate making including hardware and software / negative film and liquid resin / machine and supplies / installation and training. f. Good for high speed production of platemaking 45 minutes to make a plate. g. The capital investment is low for this unique new technology. No skilled engineer is required. 3. How is the resolution of liquid photopolymer? The plate resolutions for dot is 85 lpi (line per inch) which is good enough for corrugated box plate making and printing . 4. Is the liquid plate afraid of water ink ? Although photo resin is water washable, but after UV exposures and finishing, the plate is very strong and not afraid of water based ink and durable for printing. 5. can it be reused again after first printing? 6. Shall we use photopolymer resin only from you? No, you may use any photopolymer resin as long as the quality is good. Resin supplied by us will remain the standard of plate quality and enjoy plate making after service from us. 7. How about resin consumption and other materials? Other consumables are upper film and lower film to make bag to put in the resin. Upper film (UF) is a thin transparent film in order for negative film contacting to make sharp image. Lower film is a base film with special coating to stick with resin after UV exposure. Both of films can heat melt together by a hot sealing unit to make a good bag to fill in resin without any leaking. 8. How many unit of machine for a flexoBag system? or buy NozzleBlack CTF printer for big negative making extra. 9. Any toxic or hazardous chemical used on the system. All material including photo resin are environmentally green and friendly which contents non-toxic and not harmful chemicals. 10. What kind of working spot shall we need? An air-conditioned room is good for this precision system which is making film and making plate at the same time for you, needs a clean, cool and dry place to work. 11. Where can we buy the supplies? Any shipping problem? As mentioned, due to world patent flexoBag system with total solution, you can get the consumables from our dealer. Meantime, please rely on our supply of all the consumables such as photo-resin and bag films from us, shipping to every country is very convenient now if we have no dealer in your country. 12. Do we need skilled engineer to make plate? No, after our installation and training, any unskilled operator can be a good engineer to make liquid plate from flexoBag system. We have good experiences in many countries that after our engineers’ training many corrugated box printer start in-plant plate making in 5 days after our engineers come back, they can make good plate for production and they are all new to make plate. 13. After printing, how to take off the ink? Dry up completely so that you can keep it long. 14. Shall we put chemical into the washout water? Yes, for better washout result, you have to add 1-2% of the detergent into wash water. This will also help to reduce the sticky problem with resin and bristle during washing, also to washout clean and clearly. 15. How long shall we wait to print after plate is made? Photo resin plate use water to wash, water will not penetrate into center of the image but to wash off only the unhardened resin. The image will not inflate so can put on press to print immediately after plate is made. 16. What plate making else can we do with this flexoBag system? We have many users use this system to mass production stamps, for actually flexo plate making is only an enlargement job of stamp making. 17. How about warranty from you? 18. Tips to make plate quickly? A. Always to prepare bags at fix size ready for quick use as PS plate. 19. Any other suggestions to flexoBag users? A. To keep working area clean and neat is the basic demand to make a beautiful and clean plate. B. Use rough brush to clean off resin residue in the center of brush everyday as well as clean the filter off when finish the job. C. Clean up water in washout unit after work and keep it fry for using next day. Thus will prolong the equipment life and make beautiful plate for you. to Mr. Hilson Haung. CEO of Flexo Technology Inc. for translaating his book into Chinese. Then in 1993. Mr. George Parisi, President of FFTA. Grant the translating authority to Mr. Huang the bible of Flexo “Flexography Principles and Practices” this was the first official introduction of this new technology into China. Until now thousands of flexo presses are used in the printing industry. “FlexoBag” concept is another new idea of Mr. Huang. With his experience in flexography over 30 year. He create this innovative method to make flexo plate from liquid resin by putting Into a bag to simplify the access as well as using negative film as one side of the bag in Order to gain a sharp image which is superior than conventional liquid plate making and solvent wash solid plates. operating under these condition the shelf life is 5-6 years. For 35 years in package the company has been located in E-Land, the Eastern side of Taiwan –an isolated area before the freeway was built five years ago (June 2006), due to inconvenient transportation from Taipei city areas (which is on the North-west side of the island). In the past it took around 4 hours to get there –nowadays it's only about 40 minutes when taking the tunnel (about 13 kilometers/8 miles). DJ Cartons operates three printer slotters for multi-colour carton printing to cater for the demand for packaging in the Eastern areas like Hua Lien and TaiTung counties. Now they have the ability to expand their territory to the city areas ; in Taipei DJ Cartons has opened a liaison office to take the orders after their own in-plant platemaking system from @flexoBag had been started. In the past DJ Carons had to rely on tradeshops in Taipei to make the plates. They spent around TWD 150,000 a month which was not competitive. The total annual expenses for platemaking amounted to TWD 2,000,000; some TWD 8.00 per square inch (6.5 cm 2 ). Now that DJ Cartons has started @flexoBag system, the total cost has come down to only TWD 1.80 square inch, which also includes the costs for making the negative. Using the LaserBlack Enhancer this is a very economic and convenient way for making a negative : all that is needed is a HP laser printer. The owners-two brothers-are happy with this new system as it has reduced plate costs by 75%. In addition : There is waiting time for plate delivery and the cost of transportation from West to East ; originals already having been sent online, which is quick. Two ladies in the factory were assigned to be trained as operators for platemaking for two days. They joined the production immediately, although they have had no previous experience with platemaking. They are very happy with their waterwash @flexoBag system as they do not have to stand the bad smell of washout solvent which is also toxic. The two lady operators have achieved the goal of meeting the slogan No running-in period or skilled worker required. The @flexoBag system is an new solution which can be substituted for traditional platemaking for corrugated board printing. Water washout. No solvent is required for plate washout ; the environment is now clean and Green. High productivity. With the invention of the @flexoBag system, platemaking is very quick, To produce 10-20 sqm (15,500-31,000 sq.in) of plates (thickness 3.94 mm/0.155”) in each day (one eight-hour shift) is very simple and easy. Simple stocking. No more complicated stocks of various plate thicknesses and sizes are required. Just preparing a pail of liquid photopolymer resin ( 18 kg / 39.7 lbs or 200 kg / 440.9 lbs drums). Low investment. Investment for a @flexoBag system is only 30% of a conventional liquid resin platemaking machine. Production cost. The production cost is only 50% of a solid plate with solvent washout. When washing with water the solvent cost (20-30% of the plate cost) will saved. Nov. 14-17 2011 Flexo Technology had a successful exhibition in Shanghai at All-in-print China . LaserBlack Enhancer and @flexoBag System are our major innovative products at this show. Digital innovation has made less and less photographic film users (such as no-film, no-plate printing and CTP plate making). This has made existing photographic film manufacturer intending to increase their film price accordingly due to less and less consumptions. (50-80% increased this year). during the show, many foreign visitors have enjoyed the same offer as well by taking away from the show ground. In combination, @flexoBag is a newly developed system by FTI with invention / patent which has been granted in many major countries already and pending in 40 countries over the world. Using water to washout / environmental green / quick and economic are the advantages of this system, the plate making cost is only 50-70% of solvent wash plate making also touching the heart of the bosses. Contact us immediately if you are interest in these innovative products. Good day! I want to comment to you that we have been working very well all the time with flexo making plate you sold us since 2010 and also plates have a good quality and they are more flexible than former plates we had before. The HP 5200 A 3 printer which we have bought from you is working very well with your LaserBlack Enhancer which enable us to make our own negative film any time in our factory at very low cost and it is very convenient. As to the Model @A2SSF flexo plate making machine, which is also performs very nicely of all the functions : Exposure + Washout+ Drying + Anti-tack treatment 4 in 1. Due to all stainless steel made, it looks as new as the time we have bought it two years ago. This time I want ask you quote us sheet @flexo plates like last time. Please quote all goods price under C&F Arica, Chile in American dollars, we will take insurance from Taiwan to Bolivia, please do not don't worry about it although we know the freight maybe expensive, but we still like to buy from you. requirement including: prepress + materials + plate + equipment in once and one shipment. We are a corrugated paper company with 6 flexo printer /slotter in our factory, before we make our own plate in plant, we are paying about USD 2000.- of photopolymer plates each month from the trade shops near around. Besides this, we have 10 people making hand engrave plate and a laser engraving machine making rubber plates for not so fine image jobs. Due to growing business, the owners have decided to make our own plate in our plant. printing quality as well as for expanding our future business. practical for our use and quick process of the system has increased a lot of our productivity. have found the total cost of the production including everything is less than 20% of the plates we rely on trade shop before. The owners know that using this new system is worth with no regret now. We are corrugated board company in Surabaya / Indonesia , due to labor wage increasing gradually and it is not easy to find skillful hand engraver to make rubber plate with many small letters on it, we must to find out a simple, easy economic and green way to make our own printing plate for printing the cartons in plant. Moreover, it is getting expensive for the plate we rely on trade house to make for us outside, so that we have to pay too much plate making fees every month, and it is becoming not a small sum as USD 20000.- annually. Therefore we start to search a good way to solve these problems for us and eventually we have found @flexoBag system from internet. with the DVD, the Q&A and the Feedbacks from their users by which we have found some of their users are in the very similar production situation with us. After having the comprehensive information, we have decided to place our order immediately in order to start up the plate making right after our New Year Holidays which is in the mid of September 2010. Two of @flexoBag engineers come from Taiwan at the beginning of October right after the machine had reached us and in 5 days, now we are able to make our own plate smoothly. Printers are happy because of no need to wait for plate delivery from trade shop any more or even have to go to collect the plate when we have to use it urgently. This was our first transaction with @flexoBag company and we only know them from internet. At the beginning we do not have full confidence in the first transaction with big amount to them. With regret now we have to place another bigger order to them only in few weeks after the installation to buy consumable materials such as Resin and Film from them and most important is their LaserBlack Enhancing Solution to enhance print as negative film from our HP printer works too well that we have to order more as well. It is really a genius invention from them again that we can even make our own negative in our plant for in time plate making now by which we do not have to rely on outside service from image setter to make negative film for us at all. I have to admit that we are not only happy with the @flexoBag system but also we have to thank them for their skillful and quick service offered to us to do training to our people for both plate making and for the machine maintenance. We are Chin Chia package printing company located in Dong Guan where is a major manufacturing city for all kind of goods export to most of the countries all over the world. Our job is making and printing film bags, paper bags and corrugated box supplying to the factories located in this area. At the beginning we use conventional flexo plate, but because of the green environmental requirement is getting higher and higher so that we have decided to find a more friendly method to make plates. We have made flexo plate by solvent washout for quite a long time, until it was a good chance for us to see this new announcement of water washout flexoBag system during DRUPA 2008 in Dusseldorf Germany, after the show we have made several visit to see the demonstration of how to make a bag, how to fill in the liquid resin, exposure, wash by water and request for making plates for our test printing on line to proof not only for the reproduction but also the long impression running of the plate made by the system for it is a brand new technology in the flexo printing industry. All of employees hate the strong solvent odor so much that we have to decide to use this water wash system as soon as possible. The solvent recovering department people, now they join us in printing room, for they have lost their job already. In addition to these, plate making room is no longer a dirty place like before any more. The happiest person should be our boss, not only for the production cost have been reduced 40-50% and processing time very short, most important is that the boss has returned all his investment back by now mostly because of using no solvent any more. In spring of 2009, we started to use @flexoBag plate making system, now we could not print without it for everybody love it, even our former plate making shop is using the same system following us. I am delighted to report that the @flexoBag system works well in our factory since July 2009. I made some excellent plates from liquid photopolymer by using the flexoBag system and use only water to wash it out, it is very incredible that the plate is the same quality with the solvent washout flexo plates. Now all the people in the prepress room are very happy with it because of no disgusting odor in the factory any more, every body looks very healthy now. Due to flexoBag can be prepared in advance before plate making, the bubbles are disappeared therefore it is very easy and quick (50% time consumption only) to use by just putting the film and bag in between two glasses do not have to pour in resin waiting for spreading and take off the bubbles on the machine, so the exposure process is now simple and easy for us in stead of the hard works of spreading the thin film and paving the base film (because the bubbles may happen again during this procedures). No spreader, no coater and no bubble happened, the machine is very simple so the cost of investments we have paid is only 30% of the conventional machine cost, plus the production cost is only 50% of the solvent wash flexo plates therefore we are expecting to have our return of investment quicker by June of 2010 definitely. @flexoBag is a brand new development of flexographic plate making system for corrugated & paper printing Industry. This innovative creation is experienced from both of conventional liquid photopolymer and solvent plate for 30 years. @flexoBag is faster exposure, with fine reproduction details, water wash-out, Easy and rapid operation system. For a 4 mm plate for corrugated board printing exposure time is only 5 min, wide latitude, fine details, no bubbles, tolerance within +/- 0.03mm, good for all kinds of flexo printing. Available size up to 42 x 60 inch (110 x 16cm), larger size equipment is available under your request. @flexoBag includes drying and anti-tack treatment whole process for a 4 mm plate is less than 20 minutes. Your existing plate making machine is also good enough for this system, only a new double side exposure unit is required. Most important is that total plate making cost is only 50% of a solvent-wash photopolymer plate. @flexoBag Water wash-out is the best advantage of this system, do not have to use solvent means less drying time, quick ready, saving cost from production and environmental green. Water washout time is only 3 min. for a 4 mm plate. This new liquid technology is no bubble, wide latitude, good ink transfer, high resilience, abrasion resistance, fine resolution, tack-free, excellent shoulder support for long impressions as well as low production cost. With instant and constart sealing results for the imago size you required, to avoid varidus stock for different gauges and dimensions. With high pressure air from your own air-compressor to fill in the photo-polymer resin to the bag with no bubble for immediate plate making. With air-knife to clear off and collect the unhardened photopolymer in order for reuse, by this will also increase 10-20% of your production. Double-side exposure + anti-tack treatment unit (GT) with high intensity lamps good for fine dot reproduction. With powerful air exhausting during anti-tack treatment. • Good engraving machine is very expensive, however a low end machine and hand engraving can not satisfy the users anymore…..both trade shops and printers. • Engraving process is very slow and it is not easy to engrave it in fine detailed images, which can not meet the requirements of plate maker and printers. • Laser engraving companies odor smell as burning a rubber which is in high air pollution and bad to human health. • Environmental green is an important issue nowadays, odor smell, air pollution, and using of solvents are the trends to be avoid. • Water washout - Use water to washout the plate, no more solvent is required which all the plate makers are happy with it, the environment is clean and green now. 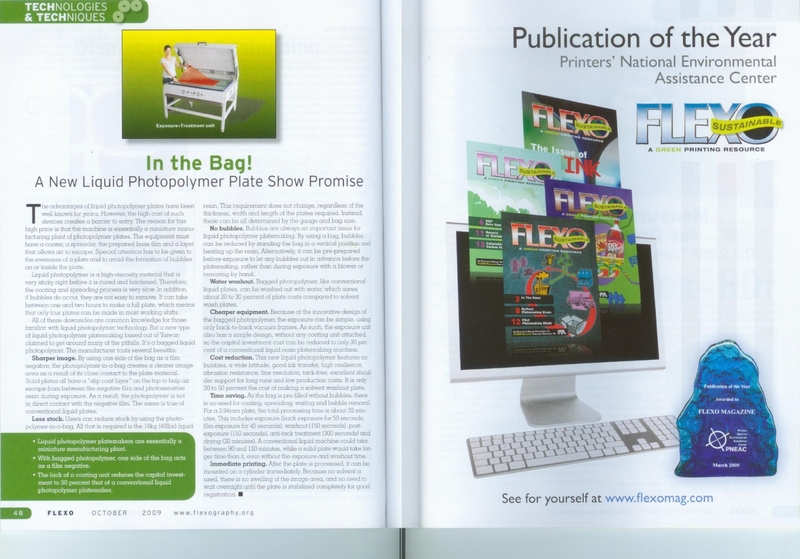 • High productivity - Due to this new invention of @flexoBag, plate making is very quick now. To make 30 square meter of plates ( 4mm thickness) in 2 shifts each day is very simple and easy now. • Simple stock – No more complicated stocks of various thickness and size to stock the plate by just preparing a pail of liquid photopolymer resin in 18 kgs or 200 kgs drum. • Low investment – By using @flexoBag System the complete set of equipment investment is only 30 percent to a conventional liquid resin plate making machine. • Employees are happy – Your employees will be happy with you wise decision for they will work under a green environment and healthy than ever before. Before and after printing, store in a dry and dark place with conditions as for A. We recommend to handle and operate under yellow safety light or UV cut lamp. For protecting skin and eyes, please wear protective glove and glass. • Determine the size of plate you want to make according to the negative film first then make the bag a little bit bigger than the negative. • Make sure base film side with sticky back and mat side film is for keeping your plate surface smooth. • Seal together with heat sealer or tapes assure that no leak of the bag, especially double secure the 2 corners when the bag is very big. area from the bottom valve into the bag by a high-pressured air compressor. • Then keep the bag in a standing rack one by one in order to be ready for exposure with negative film. • Must to have a double side exposure unit with double glasses up and down. bag or upon the bag with no difference of plate making result. C. Total exposure time is 2-3 minute (4mm plate) ratio of back and film exposure time is depending on distance and kind of light source. D. You may cut off the 4 sides of the bag, now the plate (bag) is ready for washout. • Put 1% detergent powder in the washout tank. • Must have a washout unit with water circulation and filtration system. • Washout for 1-2 minutes (4mm plate), actual washout time depends on type of washout unit. 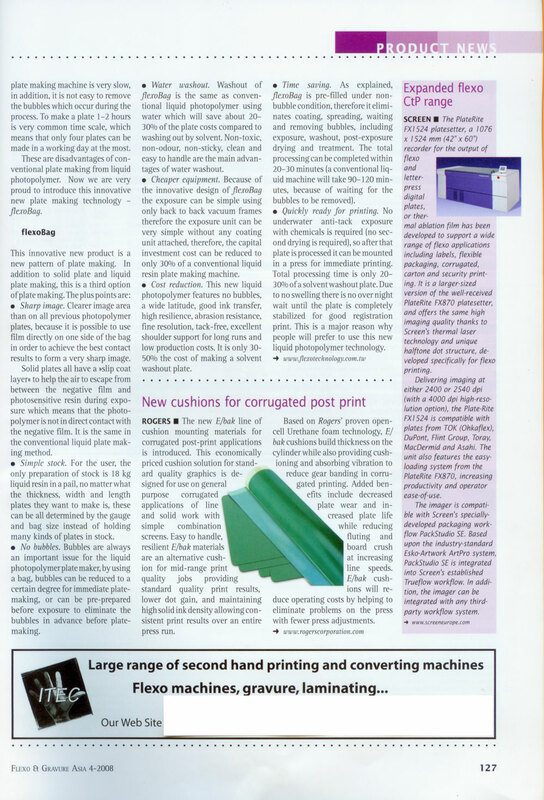 Post-exposure time have to be at least same with film exposure in order to cure the photopolymer completely. For Anti-tack treatment with light finishing, an UV exposure under water for 3-4 minutes is necessary then drying again. After these the plate is ready for mounting to print. Due to water washout, no swelling will be occurred in side the polymer as solvent wash plates, therefore the plate is press-ready now. @flexo Bag is a completely new development for corrugated flexo plate & stamp making industry. This innovation is experienced from 30 years of conventional liquid & solid photopolymer plate making. @flexo Bag is a faster exposure, with fine reproduction details, water wash-out, easy and rapid operation. for a 4mm plate for corrugated board printing exposure time is only 5 min, wide latitude, fine details, no bubbles tolerance in + / - 0.03mm, good for all kinds of flexo printing. Now size available from A5 to A0. @flexo Bag Water wash-out is the best advantage of this system, no solvent means less drying time, quick ready as well as saving cost for plate making and environmental green. Water washout time is only 3 min. for a 4 mm plate. @flexo Bag Plus drying and anti-tack treatment whole process for a 4 mm plate is less than 20 min. Your existing plate making system is good enough for this system, only a new double side exposure unit is required. For more details please visit www.flexotech.com.tw. Plate can not long run Drying under 60 C for 20 min. • Check if plate is not sharp Back to procedure 5. • If post exposure proper Back to procedure 8. Plate is lower in the middle Maybe over vacuum control. LaserBlack International is celebrating 10000-units sell of their LaserBlack enhancer since first announcement at 2002 SGIA Show in Mississippi St. Louis USA . The black density enhancer is a simple idea to coat a solution all over a toner printed page which is printed on a tracing paper (vellum) or film by a laser printer. After drying the coated solution is melting the toner and become a black layer upon the image area without any diffusion so that opaque density is enhanced 300-400% which is good enough for any kinds of plate making and its as good as a photographic film or a film outputted from an image setter. This unique enhancer has been granted inventions / patents in 35 countries and has been exported to 65 countries including developed countries, developing countries and under developed countries. All the users are happy to have this simple and easy unit as their personal image setter, especially when it is very convenient and economic to make negative / positive film for label / news paper / screen / bag / corrugated board printing and stamp making. Now they are running a campaign of “ 10000-units celebration special” with extra gift for on-line shopping. All kits are including the enhancer A4 / A3, a Quick-Black dryer and 500CC of LaserBlack-Solution which can process 1000 sheets of A4 or 500 sheets of A3. Plus extra gift of 500CC to make it 1 liter now. water washout flexo plate for corrugated printing. this exhibition period. Flexo Tech booth no. is S-145. with aspray gun is veryconvenient for rinsing the plate after washout. tank now can be switched for rinsing the plate after washout. with this device to make plate making a real pleasure. accurate stability of strict color registration jobs to combining with CTP process. 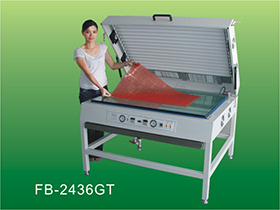 to work with CTP machine forprosperous demands of digital plate market. is proud of having this advanced unit for their digital plate making. Seminar of @flexoBag System was held during Tigax exhibition period in October 2010. Hilson Huang, CEO of FTI is delivering a speech of @flexoBag system by presenting a DVD. is inviting new technical contribution now. It is our great honor to participate the Award this year, @flexoBag plate making system RD by Felexo Technology Inc. which is expecting to be the third option of photopolymer plate making method in flexo history. delivery by door to door service now has On-Line -Shop special. kit is a FREE LaserBlack Enhancer for NEGATIVE making. The 5000th Unit LaserBalck Enhancer Special Campaign ! LaserBlack Enhancer is conducting its 5000 units sale campaign. and China Print Beijing to be our 5000th user with special offer. Topics: Newly developed and patented FlexoBag plate making system by Liquid photopolymer. Live demonstration water-base plate making to reduce 50% of cost and protect your life. @flexo Liquid photolymer resin is now available in : F-32 / F-36 / F-40 and F-50 with any color you wish, which is in the durometers of 32 / 36 / 40 and 50 Shore A.
F-32 is good for big solid area corrugated board printing with deep reverse line and character with excellent carriage of ink transferring to the rough surface of the board. F-40 is used for small and midium size character printing to reproduce the sharpness of image for corrugated board printing. Many color printers would rather like to use this durometer for color separation jobs with fine dots directly print on the surface of the corragated board. of F-36 can print good solid with reverse image as well as it can print character and line works satisfactorily. F-50 is designed for stamp making at durometer of 50 A which is a very proper hardness for hand-stamp and any kind of self-ink stamp holders for long duration. All available resins are formulated by a contemporary recipe with new developed materials which are water washable and with UVA light finishing to cover up the sticky surface before process is finished. @flexoBag System is a newly patented invetion of a FREE-SEAL sachet technology using liquid photopolymer resin and water washout to make photopolymer plate for paper / paper bag and corrugated board printing. The new concept is total different and up-side-down the conventional liquid resin plate making, due to it is in a bag, the machine is not so complicately required therefore a simple machine with economic cost is good enough for plate making, Bags can be prepared in advance to escape the bubbles according to the negative films. open for free- seal, which means that you can make a bag and prepare the resin freely with no limitation of three dimensions and quantity of a bag. You can also make any thickness plate you like by just rely on the gauges surrounding the bag between the two glasses.